Once in a great while a traditional sound rediscovers and renews itself through the work of a very few people. In the early and middle 20th century a single woman by the name of Hanny Christen set about transcribing, and cataloguing literally thousands of folk melodies from Switzerland. In addition to that basic transcription, she also noted everything she could about the instrumentation, texts of the folk songs, and even the musicians themselves, down to their names and stories about them. Thanks to her work, many Swiss groups are now rediscovering their history and performing the traditional dances and music of their culture. Which is all well and good, but to someone who isn�t Swiss the question quickly becomes "Is the music any good?" 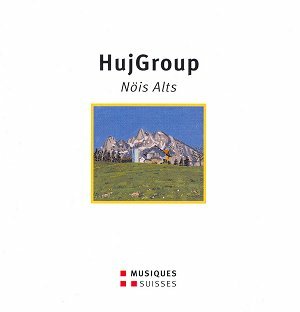 The musicians of HujGroup, along with a handful of their friends, answer with a resounding "Yes!" This is a fun album of traditional dances that are accessible, fun and energetic. More than sixty songs were selected and arranged by the musicians, of which the best were chosen for this album. The traditional dance forms from Switzerland are covered, along with a few that managed to sneak into the Swiss lexicon from Scotland or Russia. The group plays with one mind and one pulse on each track. Such high skill helps to sell the album to the skeptical listener. I will admit a bias against tuba and accordion music in general. I have even been known to define a gentleman as someone who knows how to play the accordion but chooses not to. However, as amusing as this may be, the accordion player here really kind of rocks. I found myself tapping my feet to the beat, and occasionally felt the need to jump up from my chair and waltz around the room. The tuba solidly lays down the beat where no drums lie, and the omnipresent clarinet dances through the ancient melodies, reinvigorating them with a traditional but lively flair. Various guest musicians add their distinctive touch throughout. Not all songs are without drums, and when these Swiss timekeepers get going the dancing becomes irresistible. The violin and trumpet add their mark as well, to the merriment of all. Generally speaking the musicians are well suited to the music and sound as if they truly enjoy playing together. This is truly a fun album filled with familiar song forms albeit with unfamiliar melodies. The band plays as a well rehearsed and driven unit. I started a skeptic, but will now gladly count myself a fan. Previous to this album, I would have thought that the best of Switzerland came in the form of chocolate, cheese and timepieces. I now know and understand that Swiss folk music is an export for treasure as well, and feel the richer for it.